The San Fernando Valley (known locally as “THE VALLEY” is an urbanized valley in Los Angeles County and has been called “L.A.’s bedroom”. It was founded in 1797, as the “Mission San Fernando Rey de Espana”, one of the 21 original Spanish Missions founded in Northern California, and home to pasture lands and citrus groves. Located north of the larger, more populous Los Angeles Basin, most of the San Fernando Valley (nearly two thirds) is located within the jurisdiction of the City of Los Angeles. Mulholland Drive, which runs along the ridgeline of the Santa Monica Mountains marks the boundary between ‘The Valley” and the communities of Hollywood and the Los Angeles Westside. Ventura Boulevard is the major commercial route lined with shops, stores, malls, offices, and businesses. 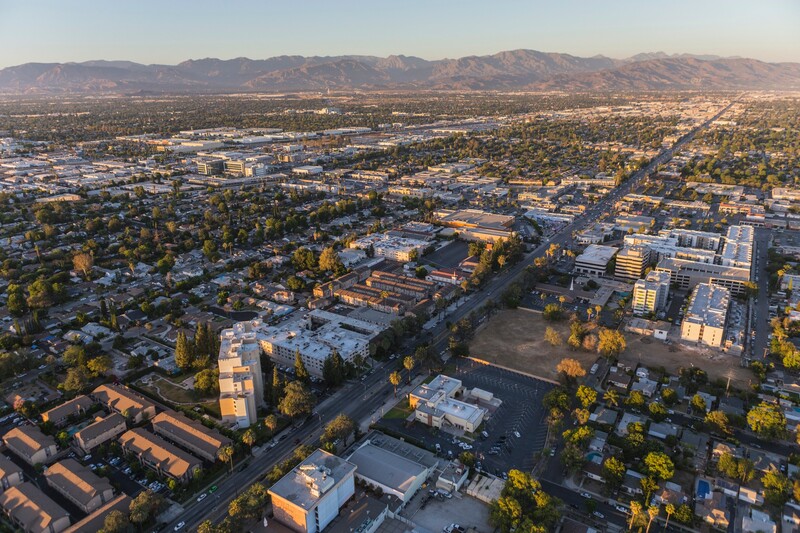 Incorporated cities in the San Fernando Valley include Glendale, Burbank, San Fernando, Hidden Hills, Agoura Hills, and Calabasas. Universal City, an unincorporated area in the Valley is the home of Universal Studios filming lot and theme park. Other major motion picture film studios located in the Valley include Warner Brothers, Burbank Studios, Walt Disney and CBS Studio Center (formerly the Republic Studio Lot).